Emily Dickinson once famously remarked that if she felt as though the top of her head were taken off, she knew she was reading poetry. And who among us did not read "It is a truth universally acknowledged, ..." and feel our heads explode? Pride and Prejudice's opening sentence is also the perfect pick-up line. The narrator zeroes in on her reader and introduces herself with what has become one of English literature's most quoted opening sentences. Austen continues to flirt with her reader in the first sentences of each of the book's 61 chapters. 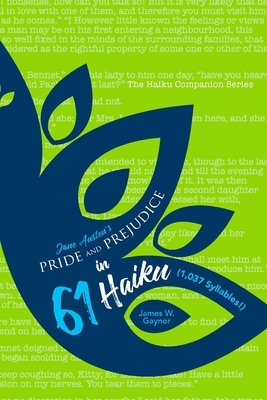 So, how better to acknowledge the power of her collective one-line poetry than by translating Pride and Prejudice's opening-sentence poems into contemporary twists on the classic Japanese 17-syllable haiku? And here you have it: Jane Austen's Pride and Prejudice in 61 Haiku (1,037 Syllables ). It is my hope that readers will find themselves smiling knowingly from time to time as they travel in this redesigned Japanese vehicle across Austen's familiar English landscape -- and that they will forgive my star-struck attempt at this love-letter-poem to the extraordinary woman who still speaks to us in ways that can blast off the top of our heads.